Skincare brand Vichy have been a long-standing favourite of mine and I have done many posts about their products as they are constantly working on and releasing exciting new skincare products. 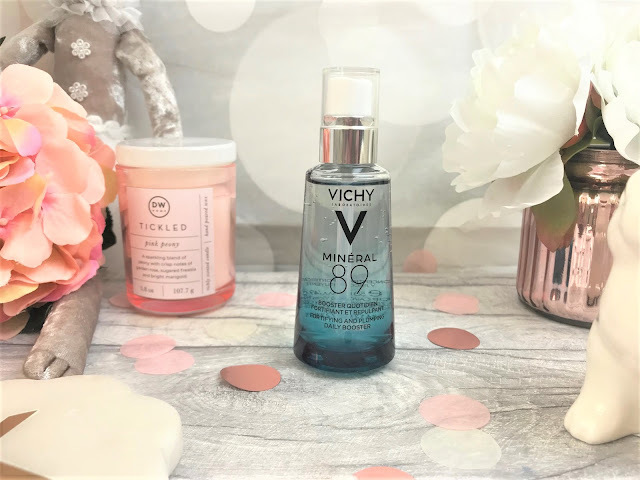 One of their most recent releases is the Vichy Mineral 89 Fortifying and Plumping Daily Booster, a hyaluronnic-based serum which contains the highest amount of Vichy's Thermal Spa mineral water out of any of their products. I am sure by now, you will know of the huge benefits that hyaluronic acid has on the skin, it plumps, hydrates and preps the skin for moisturisation. The Vichy Thermal Spa mineral water is designed to help protect the skin against environmental aggressors such as pollution, but it is also great for soothing the skin. For example, I have quite combination skin, but I also suffer from redness and a little bit of sensitivity on my cheek area, and the Mineral 89 helps to soothe those areas. 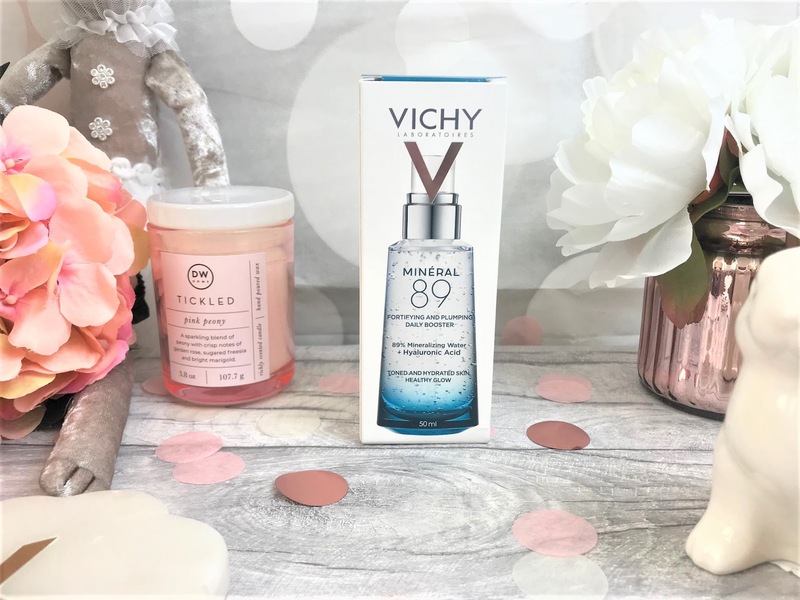 The Vichy Mineral 89 comes in a classy glass bottle with a blue ombre effect to it, and looks lovely on a dressing table. The texture of the serum is very lightweight, ensuring that it sinks instantly into the skin, refreshing the skin and ridding it of any tightness which can be caused by dehydration. The gel formula isn't sticky or tacky, and there is a very feint if non-existent scent to it, so if you do have sensitive skin, then this shouldn't irritate your skin. It is super easy to include in your skincare routine, as you only need to apply a couple of drops onto the skin after cleansing, morning and night. Because it is so refreshing and hydrating, I absolutely love using this first thing in a morning to wake me up and give my skin a boost to start the day off. I believe this product is suitable for all skin types as it has been dermatologically tested on sensitive skin, so it would definitely be great for that skin type, but also if you have dry skin, this will really work at plumping up and skin and keeping it well-hydrated. After a few weeks you will notice your skin take on a more healthier glowy appearance and I think that this is going to be a gorgeous Summer skincare staple too, as with it being a gel formula, you could pop it in the fridge for an extra cool, soothing boost. The Vichy Mineral 89 Fortifying and Plumping Daily Booster comes in a 50ml bottle and costs £22.00 and you can find it online at Vichy here.